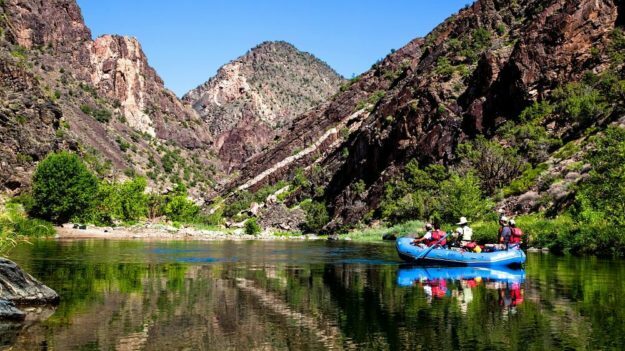 The Gunnison Gorge National Consersvation Area (Photo courtesy of visitmontrose.com). The Republican-controlled Congress on Sunday allowed the nearly 55-year-old Land and Water Conservation Fund that’s pumped more than $260 million into Colorado outdoor projects to expire despite bipartisan support for continuing to collect the revenues from offshore drilling. Republicans with oversight over public-lands issues discounted criticism over stalled efforts to renew collection of the LWCF, which was first implemented in 1964. The House won’t be back in session until after election day on Nov. 6, and while the LWCF has plenty of money in it at this point, it will reportedly no longer be collecting new revenues from offshore oil and gas drilling until the law is renewed – meaning any fees paid to the federal government will instead go directly into the general fund and not toward conservation projects. AVON, Colo. — A meeting of local business owners, policymakers and concerned citizens at Loaded Joe’s restaurant and bar Tuesday night turned into a bit of a history class on the role Vail’s founders played in preserving surrounding wilderness areas such as Eagles Nest, Holy Cross and the Flat Tops. “We don’t exist without public lands — my town, my business, Vail ski resort. None of it exists without public lands, and I think it’s absolutely imperative that everybody realizes this legacy is something that we’ve inherited and that we have to protect — otherwise we’re not going to have it,” said Jonathan Staufer, owner of Grappa Fine Wine & Spirits in Vail. Staufer’s father, Joe, was among the many Vail pioneers who helped spearhead the wilderness area preservation efforts of the 1970s and 80s. And Vail benefactor, frequent visitor and Beaver Creek homeowner Gerald Ford, the 38th president of the United States, signed the Flat Tops wilderness bill into law. Tuesday’s meeting, coordinated by Conservation Colorado’s Colorado Outdoor Business Alliance, or COBA, highlighted the critical role outdoor recreation businesses have played in shaping the proposed Continental Divide Recreation, Wilderness and Camp Hale Legacy Act, which would provide wilderness protections for an additional 98,621 acres of public land. The bill is sponsored by Democratic U.S. Rep. Jared Polis in the House and Democratic U.S. Sen. Michael Bennet in the Senate, but it has yet to get a committee hearing in either chamber of the Republican-controlled Congress. Tuesday’s meeting also focused on Trump administration policies seen as anti-conservation and pro-development of the nation’s public lands. COBA used the occasion to unveil a letter from 100 of the state’s outdoor businesses to Colorado policymakers urging them to push Congress for full and permanent reauthorization of the Land and Water Conservation Fund (LWCF), which is set to expire on Sunday. Since the 1960s the LWCF has collected revenues from offshore oil and gas drilling and used them to conserve public lands and waterways. Since its inception the fund has provided more than $260 million for projects ranging from the Gunnison Gorge National Conservation Area and Cross Mountain Ranch on the Yampa River to urban parks such as Montbello Open Space Park. Local businesses signing the COBA letter include Cirque Mountain Apparel in EagleVail, QuietKat all-terrain, electric mountain bikes in Eagle and Weston Snowboards in Minturn. Notably, Aspen Skiing Co. – often out front on issues of conservation and climate change — also signed the letter. Vail Resorts is not one of the signatories. But Vail Resorts does officially back the Continental Divide Recreation, Wilderness and Camp Hale Legacy Act, and several of the attendees on Tuesday expressed their desire for public lands preservation efforts to be nonpartisan and based on the economics of the growing outdoor recreation industry. Republican publisher Michael Cacioppo, who unsuccessfully ran for Roberts’ seat in 2016 – partly on a platform of using public lands for workforce housing — turned the conversation to population growth and just how many more residents Eagle County can handle. Another Republican businessman, Michael Dunahay – who in 2016 unsuccessfully sought an Eagle County commissioner seat – said he’s a lifelong conservationist who fully supports the Continental Divide wilderness bill.